Saint Boniface (c. 672 – June 5, 754), the "Apostle of the Germans," was a missionary who propagated Christianity among Franks and Saxons of northern Europe during the eighth century C.E. He is the patron saint of Germany and the Netherlands. Born as Winfrid at Crediton in the kingdom of Wessex, England, Boniface spent several decades studying in English monasteries and attempted unsuccessfully to spread the Christian faith in Frisia in 716. After journeying to Rome and meeting Pope Gregory II in 718, he won greater success in Germany. A second meeting with the pope in 722 resulted in his ordination as a bishop and the military protection of the Frankish ruler Charles Martel, leading to even greater success in reorganizing the German churches and converting pagans to the faith. Boniface is famously associated with the destruction of Thor's Oak in northern Hesse, which reportedly led to mass conversions and became emblematic of his triumph over paganism. Critics point out that Boniface often acted violently against non-Christian holy sites and allied himself closely with the Franks in their military campaign against the Saxons. Boniface established numerous Christian churches and monasteries, and went on to consolidate Christianity's gains against the pagans in Germany. Later in life he attempted again to convert the Frisians. Although he met with initial success this time, he was killed by a pagan mob in 754. He is thus venerated as both a saint and a martyr. His tomb is in the crypt of Fulda Cathedral. His feast day is marked on June 5 in the western churches. 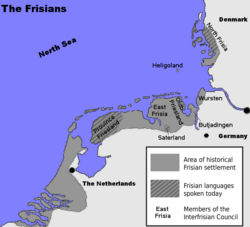 Frisia, where Boniface conducted both his first and his final missionary journeys. Winfrid, the future Saint Boniface, was of a respected and prosperous English family. He devoted himself at an early age to the monastic life, although his father did not initially approve of this decision. He received his theological training in the Benedictine monasteries of Adescancastre, near Exeter and Nursling, on the western edge of Southampton, under the abbot Winbert. Winfrid taught in the abbey school and at the age of 30 became a priest. While there, he wrote the first Latin grammar produced in England. In 716, Winfrid set out on a missionary expedition to Frisia, the coastal Germanic land extending from the northwestern Netherlands across northwestern Germany to the border of Denmark. He intended to convert the inhabitants by preaching to them in their own language, his own Old English being similar to Frisian. His efforts, however, were frustrated by the war then being carried on between Frankish Charles Martel, a Christian, and the pagan Radbod, king of the Frisians. Winfrid thus returned to Nursling without success. In 718, Winfrid visited Rome, where Pope Gregory II commissioned him to evangelize in Germany and reorganize the Frankish churches there along Roman Catholic lines. Having received instructions to make his first journey a tour of inspection, he traveled through the southern German province of Bavaria and found a number of churches and monasteries in good condition both spiritually and administratively. In the Merovingian duchy of Alamannia, he found similar conditions. The central German territory of Thuringia was considered by Rome as Christian, but Boniface discovered its people to have rebelled and killed the newly converted Duke Gotzbert and his son, Hethan II, probably because of their own overzealous attempts to force the populace to accept Christianity. A great number of the people were outright heathens, or practiced a mixture of Christianity and idolatry. Winfrid's efforts to rectify the situation were only partly successful. Receiving the news of the death of the pagan King Radbod of Frisia, Winfrid journeyed north where he spent three years there under the supervision of the aged Saint Willibrord, traveling and preaching. Many Christians who had fallen away during the persecution of Radbod reportedly returned to their faith, and many more were converted from paganism. Moving south again, Winfrid returned to Thuringia, where he reportedly converted many, then went into Hesse, where many more were brought into the fold. Two Germanic chiefs whom he had converted helped him establish a monastic cell at Amöneburg at the River Ohm as a kind of missionary center in which native clergy were to be educated. Having lapsed in his communication with the pope during his time with Willibrord, Boniface sent one of his disciples with a letter to Gregory in Rome, recounting his labors of the past years and asking for further directions. The pope expressed satisfaction with Winfrid's work but invited him to come to Rome to confer personally. The pope questioned him closely to assure himself that Winfrid held no heretical notions and required him to swear an oath of allegiance to the Roman church. On November 30, 722, Winfrid was consecrated as a regional bishop, and given the name of Boniface. 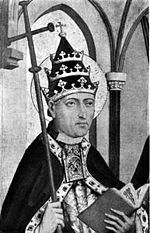 Gregory then sent Boniface back with letters to the dioceses of Thuringia and Hesse demanding obedience to their new bishop. A letter was also addressed to Charles Martel asking his protection of Boniface as the pope's representative. 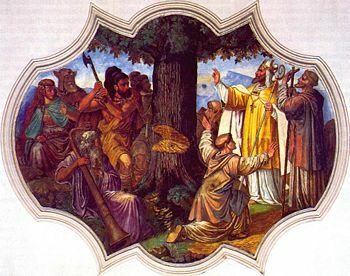 Saint Boniface prepares to destroy Thor's Oak. Thus empowered with papal authority and protected by the increasingly powerful Frankish ruler, Boniface came to see himself as a contemporary prophet Elijah engaged in a struggle against paganism. He thus mounted an aggressive campaign to destroy the pagan high places and other holy sites. In 723, famously felled the sacred oak tree dedicated to Thor near the present-day town of Fritzlar in northern Hesse. Christian legends tell of Boniface challenging Thor to strike him with lightening if he cut down the holy tree. Boniface reportedly started to chop the tree down, when suddenly a great wind, as if by miracle, blew the ancient oak over instead. When Thor did not strike him down, the local people immediately converted to Christianity. Boniface then used the oak's wood to build a chapel at the site, where today stands the cathedral of Fritzlar. Tradition holds that Boniface soon established a Church of St. Vitus at the present-day town of Wanfried, which was named for him. After this he went again to Thuringia, where he found the churches riddled with heretical tenets and pagan customs. Apparently, earlier Celtic missionaries had taught doctrines and used ceremonies at odds with the tradition of the Roman church, especially in regard to baptism, celibacy, the celebrating of Easter, and, of course, the issue of papal and episcopal authority. The neighboring bishop of Cologne also seems to have laid claim to a part of the district under Boniface's jurisdiction. Supported by the authority of the pope and the protection of Charles Martel, Boniface made substantial progress in overcoming these obstacles. The number of the faithful also increased rapidly, including many of the nobility and the educated classes. These supporters assisted him in the building of churches and chapels. In 732 Boniface wrote again to Rome and stated, among other things, that the work was becoming too much for one man. The new pope, Gregory III, congratulated him on his success and granted him the honor of wearing the pallium, also making him an archbishop, but still without a fixed see. He also gave Boniface instructions to appoint bishops wherever he thought it necessary. Boniface now enlarged the monastery of Amöneburg and established a new monastery at Fritzlar near the River Eder, which was completed in 734. A magnificent church at Amöneburg was finished in 740. Meanwhile, in 738, Boniface made his third journey to Rome, intending to resign his office and devote himself exclusively to the mission among the still-pagan Saxons. Gregory III received him graciously, but would not allow him to resign. Boniface remained in Rome for about a year and then returned to his mission, invested with the authority of a legate of the Holy See. In 742, one of his disciples, Sturm, founded the abbey of Fulda not far from Boniface's earlier missionary outpost at Fritzlar. Although Sturm was the founding abbot of Fulda, Boniface was much involved in the foundation. The initial grant for the abbey was signed by Prince Carloman, the son of Charles Martel. In 745, Boniface was finally granted Mainz, a key Frankish stronghold, as his metropolitan see. From this base, Boniface went to Bavaria and founded there the bishoprics of Salzburg, Regensburg, Freising, and Passau. The support of the Frankish chiefs and the early Carolingian rulers was essential to Boniface's success. In return, Boniface brought the strength of the Roman religious and administrative tradition to the Carolingian kings, and he also provided education for them and their courts. It was with Charles Martel's help that Boniface established the Bavarian dioceses of Salzburg, Regensburg, Freising, and Passau and reigned as metropolitan archbishop over all Germany east of the Rhine, with his seat at Mainz. Boniface had been under Charles' protection since 723. The saint himself reportedly explained to his friend Daniel of Winchester that without the protection of Charles Martel he could "neither administer his church, defend his clergy, nor prevent idolatry." Meanwhile, the Frankish Christian leaders desired to defeat their rivals, the Saxons, who were not Christians, and thus incorporate the Saxon lands into their own growing empire. Boniface's effective work in weakening the indigenous Germanic faith and destroying its holy sites was thus an important service to the Frankish kings. Boniface attempted to maintain some independence, however, by attaining the support of the papacy and of the non-Frankish rulers of Bavaria. In the Frankish, Hessian, and Thuringian territories, he established the dioceses of Büraburg, Würzburg, and Erfurt. He also organized provincial synods in the Frankish church and maintained a sometimes turbulent relationship with Charles Martel's son Pepin the Short, the king of the Franks, whom he may have crowned at Soissons in 751. By appointing his own followers as bishops, he was able to avoid subservience to the Carolingians, who were content to give him leeway, as long as Christianity was successfully imposed on the Saxons and other Germanic tribes. Boniface had never relinquished his hope of converting the Frisians, and in 754 he set out once more with a small retinue for Frisia. There, he baptized a great number and summoned a general meeting at a place between Franeker and Groningen. Instead of his converts, however, a group of armed pagan inhabitants appeared. Enraged at Boniface's attempt to destroy their native religion, they slew the aged archbishop, justifying their action on the grounds that their law (The Lex Frisionum) called for capital punishment for those who destroyed their sacred shrines. 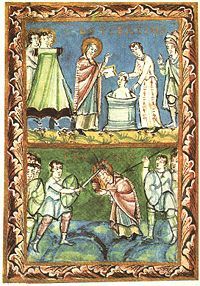 Catholic versions of the event claim that the Frisians killed the saint because they believed the chests he carried with him contained gold, but were dismayed when they discovered that the chests held only the bishop's books. His remains were eventually buried in the abbey of Fulda, after resting for some time in Utrecht. They are entombed within a shrine beneath the high altar of Fulda cathedral. The forcible conversion of the remainder of pagan Germany up to the Elbe River was completed by Charlemagne, who destroyed the Saxons' independence, though not that of the Frisians, in the last decades of the eighth century. More than any other Christian missionary, Boniface is credited with the conversion of Germany to the Christian faith. At the same time, his ministry remains clouded by the fact that he used violence in destroying pagan shines, and put the Catholic faith at the service of the Carolingian kings in their war for dominance against their Saxon enemies. The felling of Thor's Oak, so praised in triumphalistic Christian traditions, today has also come to symbolize the arrogance of Christian missionaries and their insensitivity to native customs. Monuments to St. Boniface abound throughout Europe and the United Kingdom. The UK National Shrine, located at the Catholic church at Crediton, Devon, contains a bas relief of the felling of Thor's Oak. A statue of Boniface was unveiled by Princess Margaret in his native Crediton, located in Newcombes Meadow Park. There is also a wooden statue of him in the Anglican Church there, as well as churches dedicated to him in other cities. 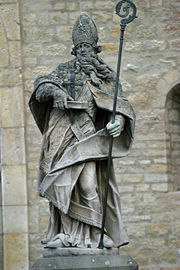 In Germany, a famous statue of St. Boniface stands on the grounds of Mainz Cathedral. A more modern rendition stands facing the cathedral of Fritzlar. Several churches are dedicated to him in Germany and the Netherlands. A cathedral has been dedicated to him in Winnipeg, Manitoba, Canada. Known as Saint Boniface Cathedral, it is a city landmark. St. Boniface's feast day is June 5 in the Catholic Church, the Lutheran Church, and the Anglican Communion, and December 19 in the Eastern Orthodox Church. ↑ However, some sources say that Winfrid had taken this name at the time of his religious profession; and others claim that he received it on his first visit to Rome. This page was last modified on 5 August 2015, at 20:38.